Mariell's best selling vintage wedding earrings feature Genuine Freshwater Pearl drops and glistening Cubic Zirconia in a glamorous rose gold Art Deco bridal jewelry design. Our estate quality earrings create the perfect touch of elegance for brides, wedding parties, mother of the bride, holidays, formals, bridesmaids or any special occasion. With their classic heirloom styling and timeless silhouette, Mariell's gorgeous pearl bridal earrings are a must-have for every woman's jewelry collection. 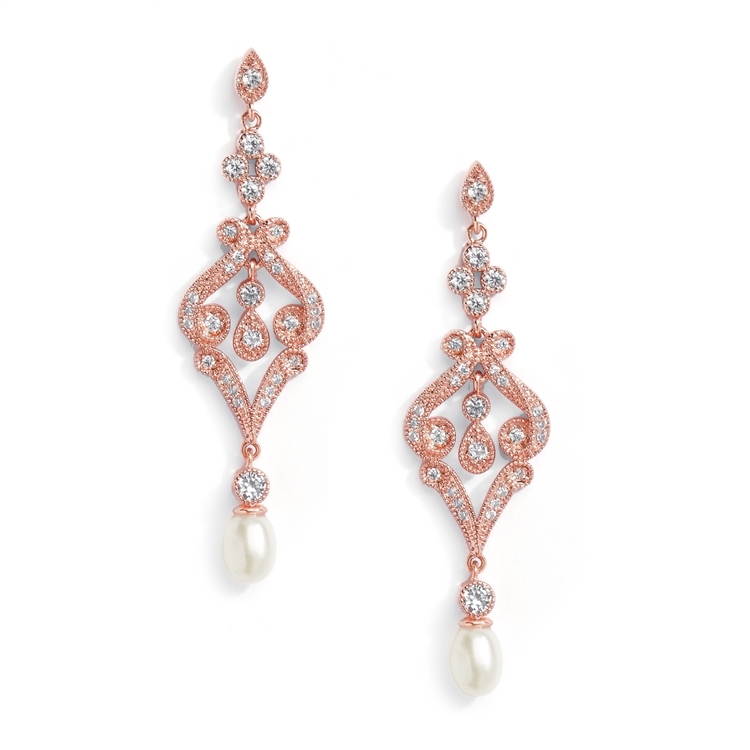 One look at these antique reproduction blush gold earrings and you can see for yourself that the Mariell brand is dedicated to creating affordable statement jewelry that evokes exquisite diamond and pearl stunners. These ever-popular bridal earrings are meticulously crafted using Genuine Freshwater pearls and top Quality AAAAA Cubic Zirconia plated in Genuine 14K Pink Gold for the look of priceless antique-reproduction Art Deco jewelry. We promise you'll adore our top-selling pearl earrings or your Money-Back. Treat yourself or someone you love to some seriously gorgeous Gatsby-inspired sparkle at a fabulous low price. As always, enjoy Mariell's exclusive 100% Risk-Free Purchase and Lifetime Guarantee.